Gowing's manifesto is short on philosophy, long on facial hair, and bound to appeal to high-brow and low-brow readers alike. Do not let the publisher's imprint fool you. What the British Library and University of Chicago Press have reprinted is a delightfully entertaining manifesto that is short on philosophy, long on facial hair, and bound to appeal to high-brow and low-brow readers alike. 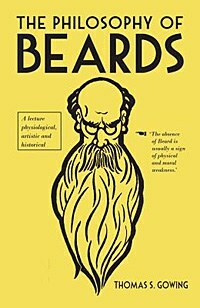 Originally a lecture delivered in the mid-1800s before a "good-humored auditory", the printed version of Thomas S. Gowing's The Philosophy of Beards, the author states in the preface, aims to "afford both amusement and information" to readers, and it is in this spirit that the book should be read. Gowing begins his lecture not with an invocation to the muse, as Homer does in his epic poems, but with a condemnation of that "most capricious of goddesses" -- fashion. "O Fashion!" he laments. "What strange vagaries playest thou with the sons and daughters of men! What is there so lovely, that thou canst not, with a word, transform into an object of disgust and abhorrence?" The beard, he acknowledges, has always been subject to fashion's "changeable humors", and if the beard has come under attack from fashionistas and the ill-informed, well, Gowing must defend it: physiologically, aesthetically, historically, ecclesiastically, and personally. Physiologically, the beard makes its appearance at the onset of puberty; that is, "with one of the most important natural changes in a man's constitution." For this reason, "it has in all ages been regarded as the ensign of manliness." Motivated, perhaps, by the 19th-century pseudo-science of phrenology, Gowing claims that "the rise and fall of this natural feature has had more influence on the progress and decline of nations, than has hitherto been suspected." More specifically, he argues that "in tribes wholly without, or very deficient, there is a conscious want of manly dignity, and contentedness with a low physical, moral, and intellectual condition." And it is not just moral character that is at risk; we are told that a good beard also protects the "white threads of nerves radiating to the jaws" and "the nerves of the teeth" along with "the tonsils, and the glands of the throat and larynx." Hmmm... Worried about ebola, tuberculosis or some other malady? Grow a beard! "It is a highly interesting point in a consumption-breeding climate like ours, where thousands of victims annually die, how the entrances to the air passages and lungs are protected by the upper part of the beard -- the mustache." Modern readers will need to keep in mind that Gowing was writing for a British audience, in another era, of course; local climates may vary, and so will the more salubrious effects of the beard, no doubt. For those wondering why, given the obvious salutary benefits of the beard, nature failed to endow females of the species with them, Gowing suggests that women "were consequently never intended to be exposed to the hardships and difficulties men are called upon to undergo." Not only, but citing a Mr. John Marshall, he agrees that "nature leaves nothing but what is beautiful uncovered, and that the masculine chin is seldom sightly, because it was designed to be covered, while the chins of women are generally beautiful." Hence, ladies, no need for beard-envy. Still, Gowing recognizes that some may not be entirely convinced by his physiological arguments, so he proffers an aesthetic one, as well. Before taking a razor to your face, gentlemen, consider this: "It is indeed impossible to view a series of bearded portraits, however indifferently executed, without feeling that they possess dignity, freedom, vigor, and completeness; while looking on a row of razored faces, however illustrious the originals, or skillful the artists, a sense of artificial conventional bareness is experienced." And the effect is compounded with age. "There is scarcely indeed a more naturally disgusting object than a beardless old man," which he says has rightly been compared in some cultures to a "plucked pigeon ... with all the deep-plowed lines of effete passions, grasping avarice, disappointed ambition, the pinchings of poverty, the swollen lines of self-indulgence, and the distortions of disease and decay." Gowing reminds the more religiously inclined that the Bible tells us "thou shalt not mar the corners of thy Beard"; after all, man was made "in the express image of God", so why risk the wrath of the Almighty? I stated above that Gowing's lecture was short on philosophy. This is both true and not true. The arguments he makes are replete with logical fallacies: ad hominem attacks, non sequiturs, post hoc. It's not that Gowing confuses contiguity with causality; he is deliberately confounding the two; hyperbolizing here, simplifying there. It's easy to imagine him winking at the audience when he argues that "Greek freedom and Greek Beards expired together", or that, regarding Spain, "no one can question that loss of Beard and empire in that country have singularly coincided." That said, the associations he makes are indeed thought-provoking, and readers will surely find confirmation of them in popular culture. Consider the following: "Shaving in token of grief was the custom of the early Romans." When shaving became the norm, however, "the Beard was allowed to grow in time of sorrow, to denote personal neglect." What contemporary film does not follow this semiology? In the final pages Gowing refutes "four modern objections to the Beard." Were he alive today, he most certainly would have added that caring for a beard is a lot less expensive than shaving. According to Marketwatch.com, razors are one of the most commonly shoplifted items; increasingly they are kept under lock and key, or behind the register. For many modern men, this economic argument may be the most convincing. Then again, maybe Gowing's lecture is more serious than it purports to be. Here in the USA, No-Shave November is also election time, and voters' guides find their way into our mailboxes daily. Typically, photos of the candidates are accompanied by brief biographies. At one point in his lecture, Gowing says: "Though there are individual exceptions, the absence of Beard is usually a sign of physical and moral weakness." Leafing through this morning's post, I found 24 photographs of male politicos. Only one of them sported a beard. Hmm. Splash image: Man with a Beard from Shutterstock.com.